While spring marks the beginning of busy rental season, it also ushers in the start of warm and often severe weather that can threaten your real estate investment if you are unprepared. The upcoming blogs will illuminate four spring and summer weather types common to the metro Detroit region, how they can affect your rental and how you can combat some of the risks they pose. Is your rental rain season ready? 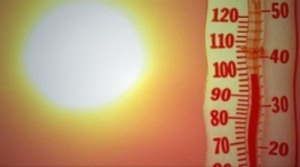 Summer time heat can be unrelenting at times, and in the “heat island” cities and suburbs where many rental properties are located, temperatures are often 2-10 degrees warmer than the surrounding countryside. These hotspots welcome extreme heat that can cause vinyl siding to bubble if not correctly installed. Ensure siding is right for the property, durable and properly installed. Roof shingles also can warp or melt in hot heat, so be sure to effectively ventilate the roof. –Combat an overheated house by planting trees and vegetation to absorb heat and create shade where possible. -Help tenants keep energy bills low and prevent brown outs by investing in quality shades on all windows. -Do not wait for hot spells to make sure fans and air conditioners work.